Lena's work features intricately carved organic forms and small sculptural objects. Lena’s work explores taking a traditional, practical object and bringing it to life as something else. Her art knives are collaborative works, each a combination of her carving and Shea's Damascus steel. Their work pushes the boundaries of a 'knife' form, the handles she carves resemble insectoid and aquatic lifeforms, evoking curiousity from across the room. "I think people find them alluring, they're drawn to them from across the room, they evoke a morbid curiosity. They love how texture resembles something wriggle and alive, but at the same time, it gives them a sense of unease - makes them hesitant to interact with them." 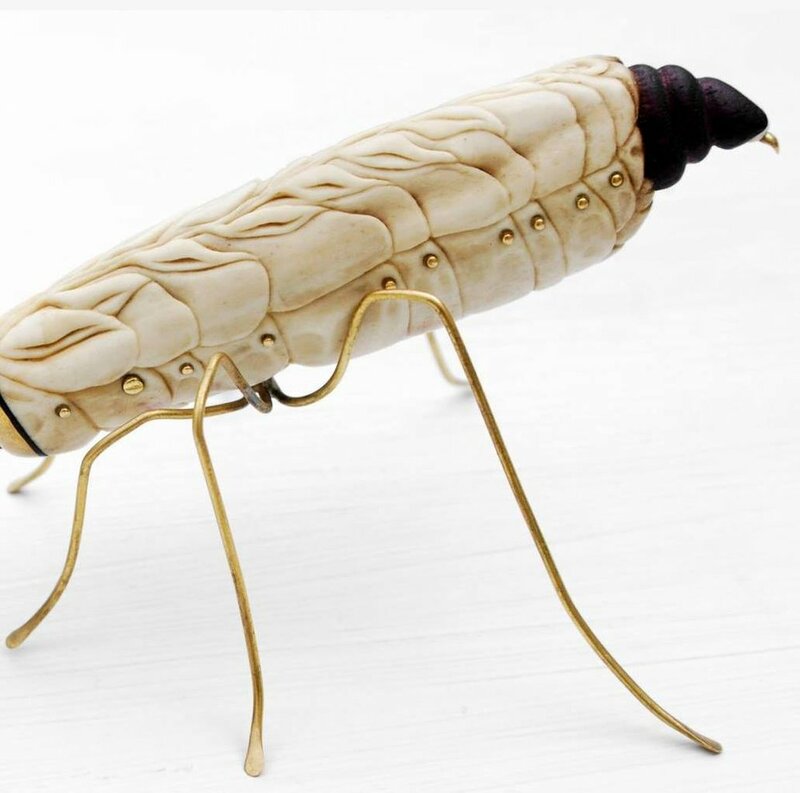 Her sculptural works focus on the style of Japanese Netsuke, small wood or bone toggles that depict a wide range of subjects, from plants to mythical beast. 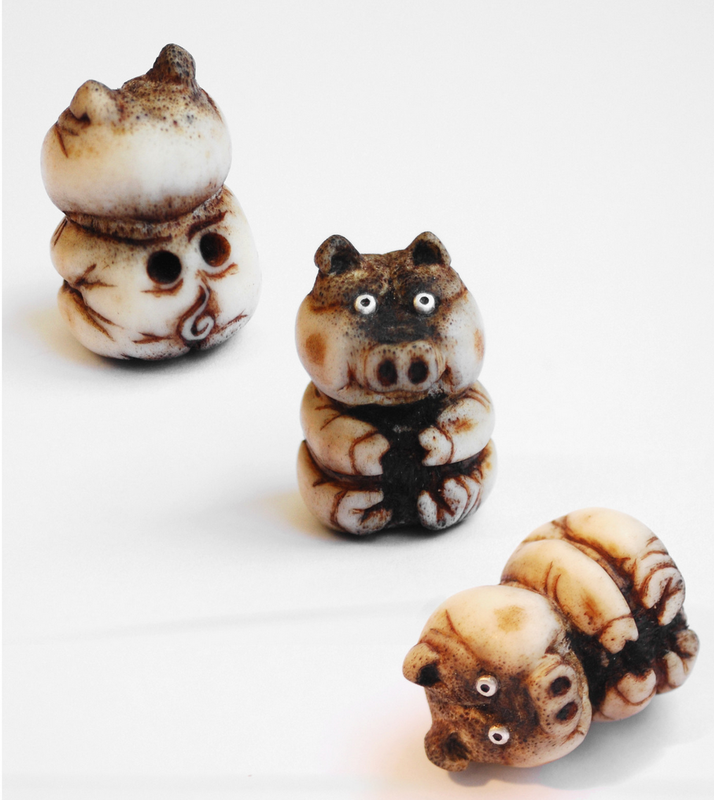 Netsuke-shi (netsuke carvers) often create a narrative within their composition. "A netsuke is a small sculptural object that, initially, served both functional and aesthetic purposes. The traditional form of Japanese dress, the kimono, had no pockets. Women would tuck small personal items into their sleeves, but men suspended their tobacco pouches, pipes, purses, writing implements, and other items of daily use on a silk cord passed behind their obi (sash). These hanging objects are called sagemono. The netsuke was attached to the other end of the cord preventing the cord from slipping through the obi. A sliding bead (ojime) was strung on the cord between the netsuke and the sagemono to allow the opening and closing of the sagemono. The entire ensemble was then worn, at the waist, and functioned as a sort of removable external pocket. All three objects (netsuke, ojime and the different types of sagemono) were often beautifully decorated with elaborate carving, lacquer work, or inlays of rare and exotic materials." "The entire ensemble was then worn, at the waist, and functioned as a sort of removable external pocket"
Shea specialises in creating hand made Damascus cutlery, sculpture and jewellery. Shea's passion for steel work is as much in the practicality as in the aesthetic. 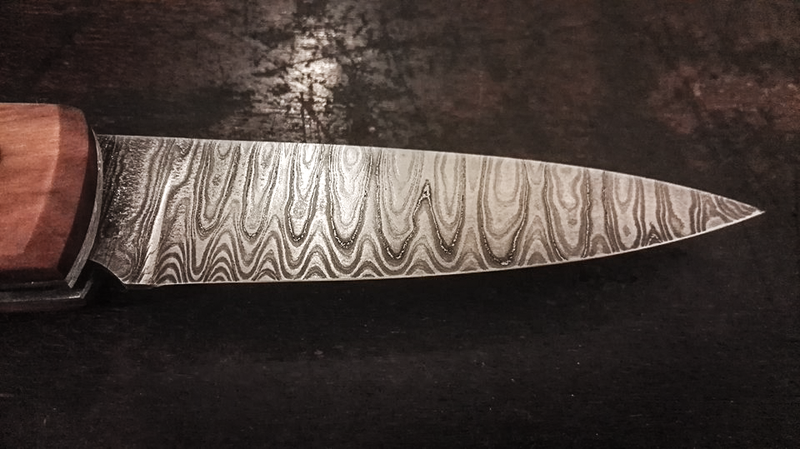 His passion for creating Damascus steel, also known as Pattern Welded Steel, developed as a way to push his materials and practice further. It is a complex and time-consuming process through which the steels are layered, forged under intense heat and folded to create a billet of many hundreds of layers, that when formed into a blade will result in an intricately patterned surface. * The terms 'Damascus Steel' and 'Pattern Welded Steel' are often used interchangeably when referring to the process of forming a blade from several metal pieces of differing composition that are forge-welded together and twisted and manipulated to form a pattern.